I finally got around to watching The Desolation of Smaug at the end of December, along with my father and my sister. I was prepared to be disappointed after An Unexpected Journey. However, I did not realize how disappointed I would really be. For the first half of the movie, I had accepted to myself, 'This is really just high-quality fanfiction. That's all. It's not going to be that close to the book" - but by the second half, I was shaking my head in utter disbelief. To say it more simply and in summary, I go with my first thought - this movie is really only fanfiction because it is so different from the book; however, there were some things in DOS that were utterly too bad to ignore. While I didn't mind the White Council in An Unexpected Journey (and, actually, I thought it was a neat idea to add it in), and I was delighted to hear that Benedict Cumberbatch would be voicing not only Smaug, but also the Necromancer, the scene with the Necromancer and Gandalf was just utterly wrong. Gandalf striding into Dol Guldur started off okay, with the memorable "Oh, it's undoubtedly a trap." But Gandalf fighting off the Necromancer? No, no, no. First of all, I very seriously doubt it would be even possible for Gandalf to hold off the Necromancer for that long, even if Gandalf is a Maia and the Necromancer was still gathering his strength. Secondly, it was the White Council that drove the Necromancer back. And then we get to leave Gandalf in prison at the end of the movie. The dwarves preparing to enter the Lonely Mountain. Maybe it's me being picky, but I didn't like the whole battling-Smaug-off thing in the Lonely Mountain. Perhaps it works in the mind of Peter Jackson, but for me, if the dwarves had attempted battling Smaug in a real-life setting, they would have been burnt to a crisp very quickly. The scenes seemed very contrived and I don't think the dwarves would have so many plans up their sleeves that fast. And it's insulting Smaug's intelligence by having him walk above and the dwarves just quickly escape on the level below him. Smaug is not a stupid dragon. In fact, he's very, very intelligent. I thought it was a good idea to do this to a certain extent, but in all honesty, I think Peter Jackson is trying just a little bit too hard. For me, The Desolation of Smaug focussed more on the events leading up to The Lord of the Rings instead of on the actual story. Very much like The Two Towers, the second movie was very dark (just one of the many parallels Peter Jackson has thrown out so far) - and The Hobbit is not supposed to be dark...at least not until the Battle of the Five Armies, as I see it. :) I think all the parallels P.J. is throwing in also show he's trying a little too hard. For example, the scene when Tauriel comes to "save" Kili, she appears in a ray of light, reminding me (and my sister, who picked up on it right away - and she's smart, to say to the least) of the Arwen/Frodo scene in The Fellowship of the Ring. The dwarves try to lock out their host. So Kili gets badly wounded just so Peter Jackson can stick in some more Kili/Tauriel time (a pairing I actually didn't mind as much as I thought was going to, but it still is definitely not necessary)...and then Kili gets left behind, along with Fili, Oin, and Bofur. What?!?! The pale orc, Azog the Defiler, was the big controversial thing for me in the last movie. However, there were so many bigger problems that I didn't even mind him that much. Or I just got used to him. 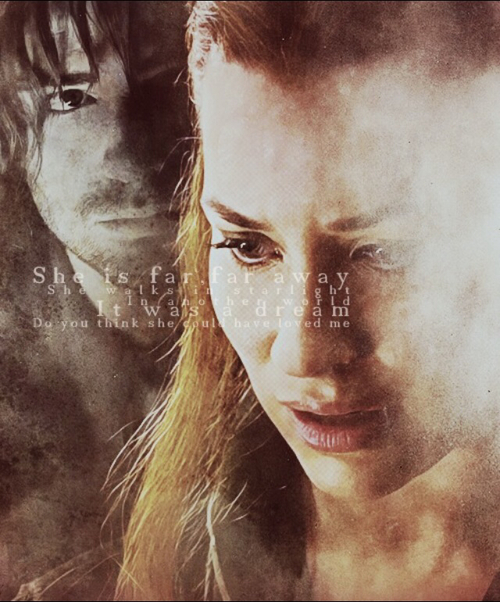 Maybe that's why I didn't find the Kili/Tauriel romance too bad. Keep in mind, though, that I didn't particularly care for it - I just find it an 'okay, I guess' thing. The same goes with Legolas. 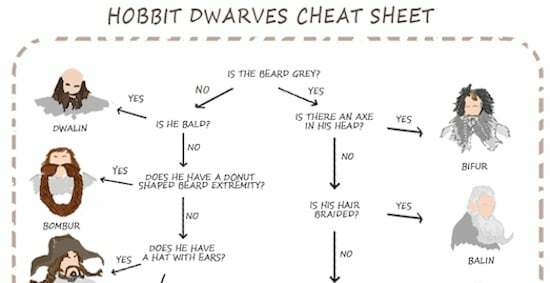 Honestly, though, what I'd really like is to get to know the dwarves better. I still can't tell the differences between most of them. Need to see the rest of the chart? I certainly do! Here it is. So If Not That, Then What Did I Like? Ah. A very good question. Smaug was the #1 thing I was looking forward to in The Desolation of Smaug...and he turned out to be the #1 thing for me in DOS. In fact, besides that little bit where Smaug talked about Sauron and also caused Bilbo to become un-invisible (which was just so wrong), the scene with Smaug and Bilbo was the best scene of the entire movie. It was chock full of book quotes and Smaug was so very Smaug-y. Might I just add that Benedict Cumberbatch was a brilliant casting choice. 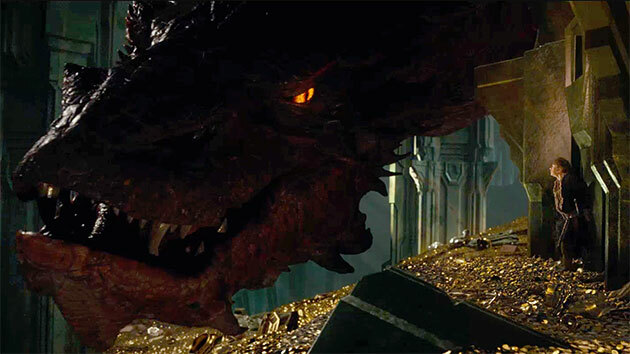 And just a side comment - I had no idea that Smaug would be THAT big. And every time he breathed fire, my eyes hurt and I had to blink them. Fantastic stuff. 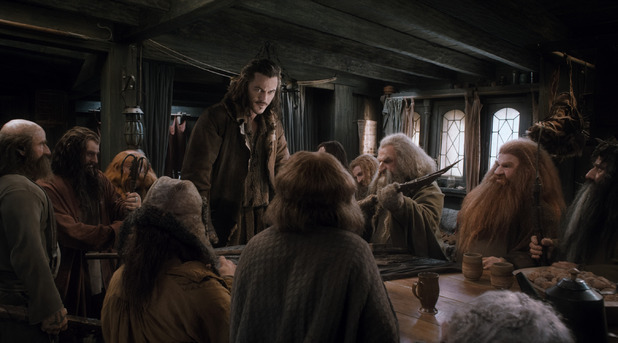 Bard brings the dwarves into his home. I didn't realize that there would be so many Peter-Jackson-additions of scenes with Bard. Somewhat ironically, I think, however, his scenes were the deviations I did, in fact, like. I loved Bard's little family, and Bard's honourable disposition...and pretty much everything about him. I have to give P.J. a thumb's up for this one because I know it's going to be this backstory that is going to make me rooting for him to kill Smaug even more than the action in itself. He was as greedy as could be, just like he should be. I can't find really anything wrong with this character's portrayal at all. The dwarves look upon Dale and the Mountain. After you get past the outrageous parts, this movie was good fanfiction. The hobbit theme music played at the beginning wasn't the only part that had me smiling with nostalgia (and perhaps a bit idiotically). with too much action and not much substance. With all the parallels and the focus on many fighting scenes, Peter Jackson seems to have forgotten the story of The Hobbit. It's not the fighting. It's not the exciting stuff. It's not even so much the adventures. It's the heart and soul of Tolkien that brings us 'the stories that stayed with us'. That is something that P.J. seemed to forget with all the focusses on tying-in, fighting, and love stories. 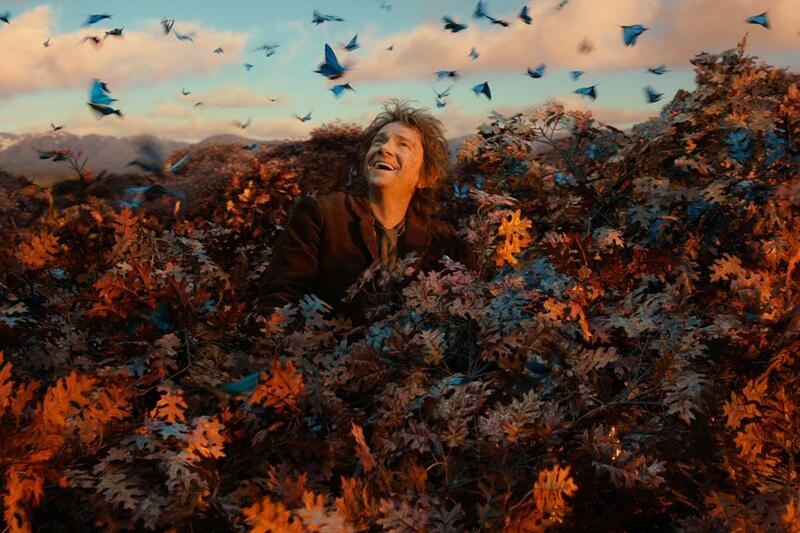 The Hobbit is not meant so much to be a story of dwarves reclaiming treasure. It is the story of a hobbit, how the smallest person can change the course of the future, and how the little things of this world are the things that matter. There was almost nothing to be found of that in this adaptation. I'm looking forward for the end of the trilogy (that should have never been a trilogy in my eyes) this December, but I am prepared to be disappointed unless Peter Jackson does something really good to bring everything back together. I sort of doubt it, but it's something to hope for. I agree with everything you said. The number one unforgivable mistake for me was when the dwarves try to fight off Smaug. It was so unrealistic and so far from the book. 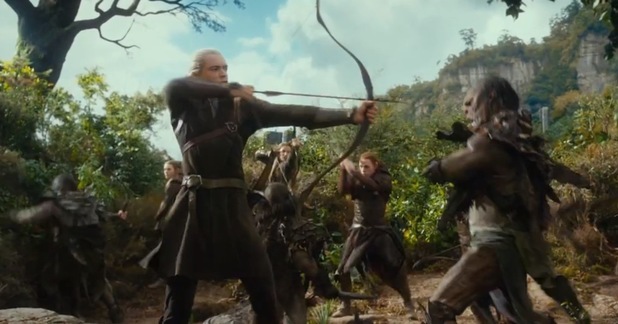 This movie didn't really feel like the Hobbit, it just felt like something else. Fanfiction is a great way to describe it. So disappointing because we know that Peter Jackson can do better than this!